Signed as a free agent on May 11, 2018. Jackson signed with the National Football League’s Green Bay Packers as an undrafted free agent on May 6, 2016. He was released by the Packers on July 25, 2016, and later joined the team’s practice squad. He made his NFL debut with Green Bay later that year, appearing in a total of three games. Jackson was placed on injured reserve on Nov. 16, 2016. He re-signed with the Packers on Mar. 8, 2017, and was released on May 1, 2017. 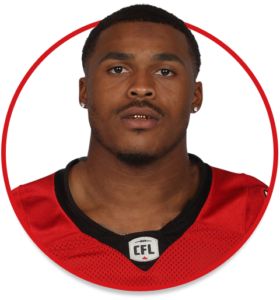 (Calgary) In his first year with the Stampeders, Jackson started 13 regular-season games at tailback. He led the team with 924 rushing yards and was among the league leaders with an average of 5.8 yards per carry. Jackson scored three rushing touchdowns and had three 100-yard games. He added 23 receptions for 168 yards. In just his second CFL game, he ran for what would prove to be a season-best 123 yards in a win at Toronto. The performance included a season-high 70-yard carry. Jackson also had 100-yard games at Ottawa and in the Labour Day Classic against Edmonton. He started both post-season games, rushing for 83 yards in the Western Final and then accumulating 53 rushing yards to go with four catches for 39 yards and the game’s first touchdown in the Stamps’ Grey Cup victory over Ottawa. Jackson played three seasons (2013-15) at Nevada after transferring from Iowa Western Community College. He had 2,318 rushing yards and 19 touchdowns on 520 carries as well as 23 catches for 269 yards and two majors in his career with the Wolf Pack. Jackson majored in communications at Nevada. He attended Laguna Creek High School in Elk Grove, Calif.